For centuries, Pekingese sat on the laps of kings and queens and had free reign of imperial palaces—and they still haven’t gotten over it. Combining keen intelligence, dignity and pride, Pekingese have a pleasant self-assurance that can be lovable, admirable and maddening all at once. Pekingese are affectionate and sensitive creatures. In spite of their self-important air, they need plenty of attention. Without it, they can get, well… peeved. They also have the tendency to become jealous and will compete for attention. Or, they’ll just growl. Like other small dogs, Pekingese have “big dog” personalities—brave to a fault. To show dominance they will pick on much bigger dogs or refuse food, games and other offerings. Figure out what they really want (without losing your own dignity or spoiling them) and they’ll snap out of it. Pekes love a little exercise, but they are not the type to hassle you for a walk every evening. In fact, you may come home from work and find them sitting on the couch, right where they were when you left them. They are ideal for the apartment dweller. Pekingese love to bark. If you’re looking for a luxurious little companion that will also alert you to intruders, look no further. Proper training and socialization can temper this a little… but not that much. Try not to overfeed them, and make sure they get regular exercise (though they may protest). Pekingese can quickly put on weight, causing health problems. 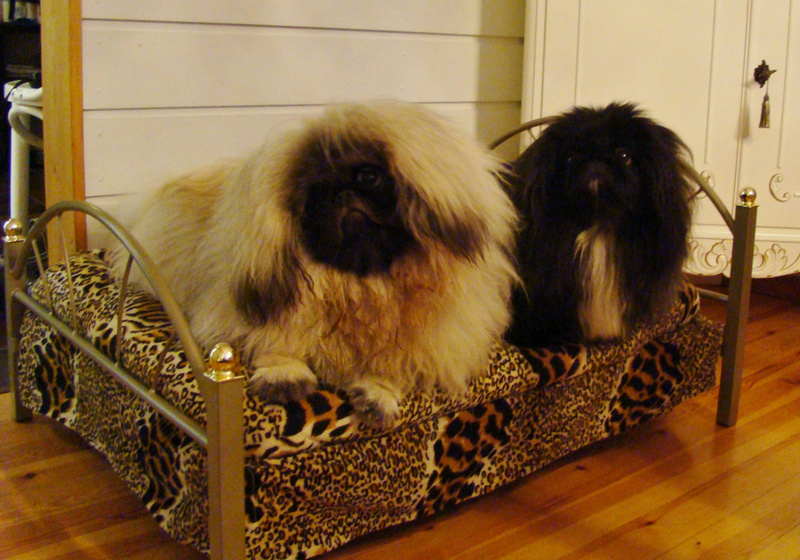 Pekingese need to be brushed several times a week to keep their coat under control. They should also have regular, scheduled grooming to keep their long hair in shape. Also, clean their eyes, ears and face regularly. They can live as long as 15 years. Common health problems include corneal ulcerations and other eye problems, heatstroke and pinched nostrils. Dating back to the Tang Dynasty of 8th-century China, Pekingese were beloved pets in the emperor’s court and called Fu Lin, or “the Lion Dogs of China,” because of their regal attitudes and flowing manes. For centuries Chinese royals and nobles carefully bred these dogs. In 1860, British troops raided the imperial summer palace and discovered these dogs. Several “Pekes” were brought back to Europe, where they were given to queens and duchesses, boosting their exposure and popularity. 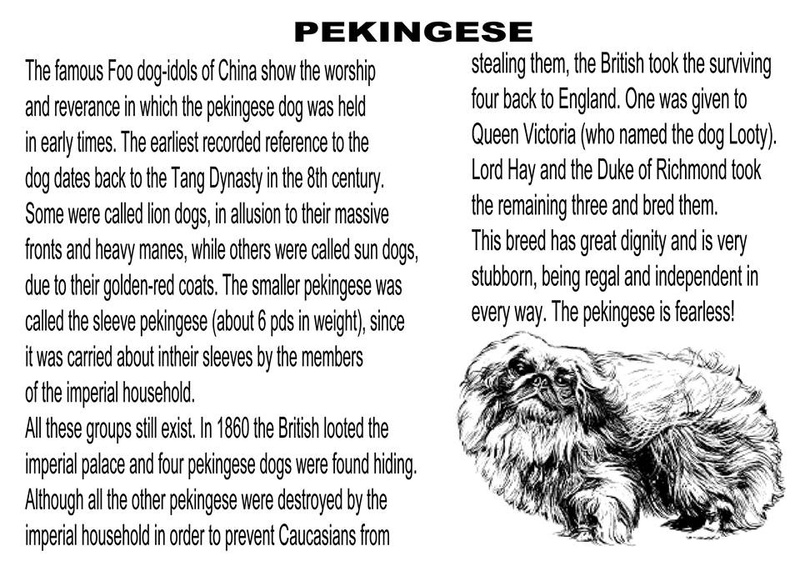 The AKC registered the Pekingese breed in 1906. Pekingese are compact dogs with long, flowing hair—truly “lion-like” in the way they look and how they carry themselves. Their wide flat heads have dark, slightly prominent (but not bulging) eyes, flat faces, dark wrinkled muzzles and hanging, heart-shaped ears. Their somewhat long bodies have fringes of hair hanging on either side and their arched tails are carried over their backs. They can come in almost any color. 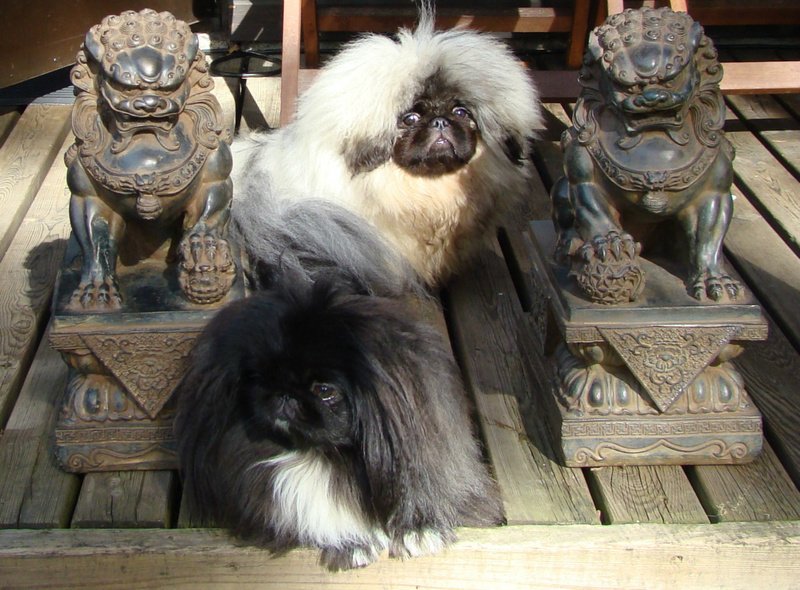 Overall, Pekingese are small but heavy boned, resulting in a dignified, rolling gait. I love this breed because the dogs have smushie faces, flat heads and the most wonderful personality of any other dog. They are sometimes a one-person dog and will comfort that person when they are not well or down. My Pekes licks tears off my face when I cry. They sits on my lap and just stays near when I'm not feeling well.